Fine Arts Museum Los Angeles: History, Acquisitions, Collection Highlights. 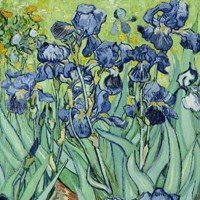 Irises (1889) By Vincent Van Gogh. the J Paul Getty Museum, LA. Run by the J. Paul Getty Trust, itself founded by the oil magnate and art collector J Paul Getty (1892-1976), the Getty Villa and Center makes up one of the best art museums in America, with over 1.3 million vistors annually. Famous for its architecture, it displays Western art from the Middle Ages to the present day. The Center also houses the Getty Foundation, the Getty Research Institute, the Getty Conservation Institute, and the administrative offices of the J. Paul Getty Trust, which operates the Center. Highlights of the fine art collection include: Arii Matamoe (The Royal End) (1892) by Paul Gauguin, and Irises (1889) by Vincent Van Gogh. In addition to the Getty Center, The J. Paul Getty Trust runs a second museum in Los Angeles, known as the Getty Villa. Located in Pacific Palisades, this museum and educational centre is dedicated to the culture of ancient Greece, Rome and Etruria, notably Greek sculpture and Roman sculpture. Designed by the renowned American architect Richard Meier, and built in the foothills of the Santa Monica Mountains at a cost of some $1.3 billion, the 110-acre Getty Center is organized around five two-level museum buildings: the North, East, South, and West Pavilions, along with an Exhibitions Pavilion which hosts temporary art exhibitions. The permanent collection is displayed chronologically in the first four pavilions, which are linked on both levels by walkways: North Pavilion contains only pre-1600 art; East and South Pavilions contain works from the Baroque to Neoclassical era 1600-1800; West Pavilion has post-1800 art, including pre-1900 European paintings, drawings, illuminated manuscripts, sculpture, and decorative arts, as well as the American and European photography collection. Many of the collections can be viewed on curator-led tours, and you can also meander through the 134,000 square-foot garden. The massive complex also has a special Family Room, gallery games, and weekend family workshops, as well as computers, picture books, and self-guided audio tours designed specifically for families. It also has a full range of eating facilities.  Irises (1889) by Vincent Van Gogh.  Arii Matamoe (1892) by Paul Gauguin.  View of the Grand Canal Santa Maria del Salute (1740) by Bernardo Bellotto.  Portrait of a Halberdier (1528-1530) by Pontormo.  Fishermen in a Venetian Lagoon (1490-1500) by Vittorio Carpaccio.  Abduction of Europa by Jupiter (1636) by Rembrandt.  A Walk at Dusk (1835) by Caspar David Friedrich.  Portrait of Albert Cahen d'Anvers (1881) by Pierre-Auguste Renoir.  Wheatstack (1890) by Claude Monet.  Starry Night (1893) by Edvard Munch.  Gabriel Bernard de Rieux (1720, pastel) by Maurice Quentin de la Tour.  Waiting (1882, pastel) by Edgar Degas.  Portrait of Louis XIV (after 1701) by the workshop of Hyacinthe Rigaud. These works make the Getty Center one of the finest art museums in America. The North Pavilion contains a fascinating display of 15th century glass objects; a diverse range of illuminated manuscripts of German, French, Italian and British origin - mostly derived from the renowned Louis Collection from Aachen; Renaissance art, mostly religious paintings, including a huge altarpiece by Bartolomeo Vivarini, as well as an exquisite Venus & Adonis from Titian's workshop. The East Pavilion has a rich display of Flemish and Dutch Realist artists. Highlights include The Entombment and other works by Rubens; Christ Crowned with Thorns, by Gerrit van Honthorst; Astronomer by Candlelight, by Gerrit Dou; two Flemish paintings from the Rogier van der Weyden school; as well as genre-works by Jan Steen, landscapes by Jacob Ruysdael, and others. The South Pavilion ground floor contains a magnificent collection of French decorative art from the 17th and 18th centuries. First floor highlights include two paintings by Thomas Gainsborough, Baronne de Domecy by Odilon Redon, and numerous enchanting pastels and watercolour paintings. The West Pavilion ground floor is devoted to European sculpture plus decorative arts spanning the late-18th and 19th centuries, as well as items from the drawing collection. The latter features works by Albrecht Durer, Hans Baldung, Raphael, del Sarto, Paolo Veronese, Rembrandt, Rubens, Nicolas Poussin and Jean-Antoine Watteau. Upstairs is a display of 19th century paintings, including Van Tromp, Going About to Please His Masters by JMW Turner; several Impressionist canvases by Claude Monet, Camille Pissarro, Edgar Degas and Toulouse-Lautrec; a still life by Paul Cezanne; Portrait of Albert Cahen d'Anvers by Pierre-Auguste Renoir; Arii Matamoe by Paul Gauguin; and Van Gogh's Irises. The West Pavilion is also home to the museum's American and European collection of fine art photography. This features numerous original prints dating from 1841, as well as others from the 19th century. Modern and contemporary lens-based artists are also well represented, including Man Ray, Imogene Cunningham, Walker Evans and the German photographer August Sander. The museum's collection of sculpture, dating from 2,500 BCE - including statues, reliefs and small-scale figurines - has numerous items of Greek art, as well as Roman terracotta sculpture and marbles, including the life-size marble figure of Hercules (c.150), plus masterpieces of Italian Renaissance sculpture by sculptor and goldsmith Piero Jacopo Antico, the Mannerist sculptor Benvenuto Cellini, the Baroque genius Bernini, and the French 19th century naturalist Auguste Rodin. There are a number of modern pieces, including works by Joan Miro and Henry Moore. Many of these can be viewed in the sculpture gardens located by the main entrance and by the West Pavilion.